Rainy days and Mondays rarely get me down. I love cool gentle rain and staying inside with the lamps lit and nothing much to do on a lazy Monday. Afterall, I have the rest of the week to do important things like organize and prepare for a “Meet and Greet” that we are hosting for some local politicians running for office, clean my house for said meeting, and gather some pumpkins and mums for the yard. We went out to eat last night for my Birthday – it is humbling to know that I now qualify for Medicare. Where oh, where have the years gone? But back to the point of this post. After splurging last night and enjoying a quiet day today, I felt like making a humble dish for supper and to me that means quiche. 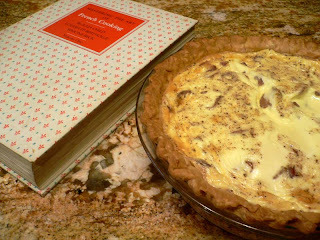 I have cooked many quiches in the past, some complicated and some unusual, but I decided to go back to a classic and the best classic that I know of is Julia Child’s quiche Lorraine. 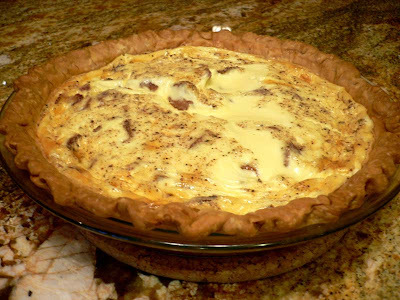 Some quiche Lorraines add sauteed leeks or Swiss cheese, but Julia’s contains only heavy cream, eggs, and bacon flavored with salt, pepper and nutmeg. An optional step is to blanch the bacon in simmering water to remove its smoky, salty taste. I happen to like the smoky taste of the bacon so I have never done this. It is up to you. Cut bacon into pieces about an inch long and 1/4 inch wide. Simmer for 5 minutes in water. Rinse in cold water. Dry on paper towels. Brown lightly in a skillet. Press bacon pieces into bottom of pastry shell. Beat the eggs, cream or cream and milk, and seasonings in a mixing bowl until blended. Check seasonings. Pour into pastry shell and distribute the butter pieces on top. Set in upper third of preheated oven and bake fro 25 to 30 minutes, or until quiche has puffed and browned. Slide quiche onto a hot platter and serve. On another subject that does get me down, I have just heard that Conde Nast has decided to stop publishing Gourmet magazine. In our tight economy, sales are down and for some reason it makes sense to them that this magazine is expendable. Gourmet has been published since the 1940’s. It is an institution in the food world and for some of us a tradition that is as important as Mom and apple pie. This rash action on their part is unbelieveable. Sometimes there are more important things in life than the bottom line. The economy will turn around someday and then where will we be? Left with populist magazines like Paula Deen’s and Rachel Ray’s I’m afraid. I have nothing against either of them, but there is a place in the publishing world for well written food articles and insightful prose. Posted on October 5, 2009 at 12:24 pm.